The Miracle League exhibition game between the Lehigh Valley team and the Northampton squad will take place from 5 p.m. to 5:45 p.m. In order to allow fans to watch the one-inning contest, all Coca-Cola Park gates will also open promptly at 5 p.m. Dozens of children will take part in the 8th annual Miracle League game at Coca-Cola Park. During the game, each child will have the opportunity to bat and play in the field and the IronPigs players will serve as "angels" and assist the players in all areas of the game. 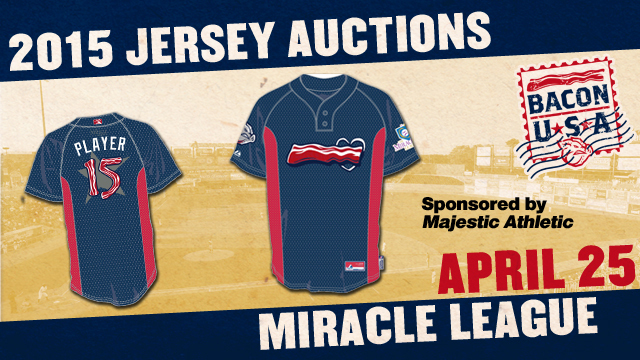 IronPigs fans can bid on their favorite player's jerseys from anywhere with the easy-to-use Qtego service that allows fans to place bids, receive notifications when outbid and check the status of their item via text messages on their mobile phones. Fans without texting access can even call in their bid after registering their phone at Coca-Cola Park. Register your phone from anywhere in the U.S. by texting "Pigs" to 79230. The bidding begins on April 24 and ends promptly at the end of 7th inning of the April 25 game. Detailed instructions on how to place your bid will be made available at ironpigsbaseball.com. Single-game tickets for the 2015 season presented by Capital BlueCross are available now by visiting ironpigsbaseball.com/tickets, by calling (610) 841-PIGS (7447) or via the Coca-Cola Park ticket window during normal business hours. Season tickets, ticket plans and group tickets are also on sale now. The 2015 IronPigs baseball season at Coca-Cola Park is presented by Capital BlueCross.